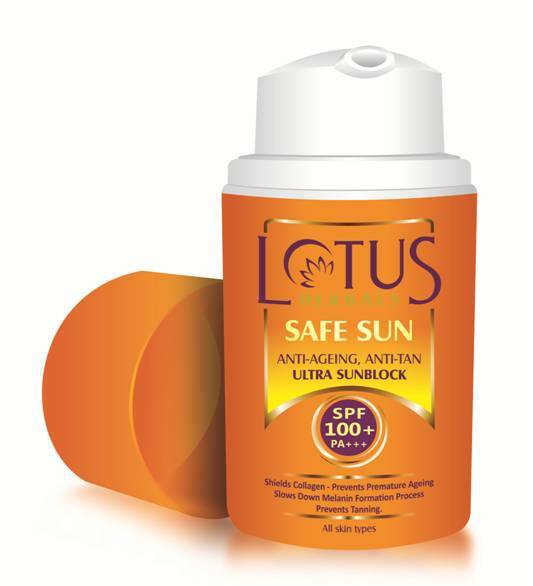 To celebrate the launch of the New Safe Sun Ultra Sunblock with SPF100, Lotus Herbals is running an exclusive Facebook offer for fans where the fans will get free samples of SAFE SUN Daily multi-Function Sunblock SPF 70. The offer will be running on 10th April 2013(i.e. today) only and would be active for 100 minutes. What is this new product? SAFE SUN ANTI-AGEING ANTI TAN ULTRA SUN BLOCK SPF 100 is a revolutionary, preservative free sun block which offers the highest protection against UVA and UVB rays. It blocks all damaging effects of UV rays to skin, SHIELDS COLLAGEN to reduce chances of premature ageing and delays skin tanning process. Its key ingredients include – Soy protein, Thyme and Licorice. Shields COLLAGEN to reduce chances of premature ageing and retard skin tanning process. Don’t miss the Facebook offer today, for more details stay tuned on the Lotus Herbals Facebook page here.